Peter Staaterman's pumpkin patch started out innocently enough. He was paging through the seed catalog with his wife Dilys—you know, the way you do in the spring, exclaiming over the new haricot verts and admiring a particularly plump new tomato—when Dill's Giant Atlantic Pumpkin caught their eye. "It has your name!" Peter remarked to his wife. "We'll have to get it!" And so they did. Needless to say, it was a black and white seed catalog, no pictures like the one you've seen up there. They had no idea—no inkling of what they were getting into. They planted the seeds, staked out a plot, and several months later were astonished to see two huge hulks of orange peeking out from under the vines. 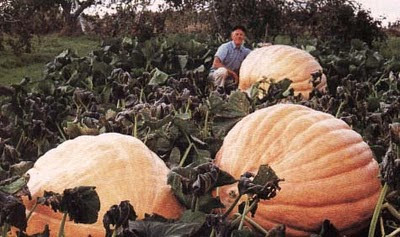 They grew only two pumpkins in a 20- by 25-foot plot: a one-hundred-and-seventy-five pounder and a hundred pounder. This seemed big—gigantic even—but astonishingly enough, it turns out, these were actually very small. Dill's Giant Atlantic Pumpkins are trademark registered as the World's Largest Pumpkin Variety, and last year, a woman named Christy Harp from Ohio grew the biggest one ever, weighing in at 1725 pounds. The seeds are sold in weight categories: 1000 lbs and up, 500 to 1000, 250 to 500. Next year, Staaterman says, he's going up. His big one won first prize at the Truro Ag Fair—a beautiful yellowy-orangey color with long, thick ribs. A woman walked by who does pies and estimated she could make 500 pies out of the pumpkin—an exaggeration, but still. Staaterman says that according to the folks at Dill's, the pumpkins are edible, and you can count on a pound per pie—which brings his potential count down to a mere one hundred and seventy five. Just the thought of it makes me want to grab my rolling pin and hide. A better use, I think—just in case any of you are thinking of going Dill's crazy next year—might be to bake the smaller ones, and make the bigger ones into the biggest-ever, scariest-ever jack-o-lanterns. Just imagine: a Dill's Giant Atlantic carved up, staring at you with spooky eyes and a hollowed out cavern of 1700 pounds. You can find the seeds over here, and more growing information over here. Happy Halloween, everyone! This is my grandmother's recipe. I've titled it exactly as she wrote it out on the card—and true to her word, this pie never fails. I usually use homemade pureed pumpkin or winter squash in place of the canned pumpkin—but that's the only tweak. Oh! and a note about amounts—this recipe makes two pies. Halve it, or give one to a friend! Preheat the oven to 425 degrees F. Whisk together the ingredients in the order given and pour the filling into the two bottom crusts. Bake for 15 minutes; turn the heat down to 350 and bake for another 45. Enjoy warm or cold, with a thick dollop of whipped cream. P.S. Peter just sent me this link to a Science Friday video on the physics of giant pumpkins. Check it out! I've read that those big ones need massive quantities of water a day to reach that size! Yikes! I would like to see those results as well! I just looked on the ag fair website with no luck, and I don't remember seeing it in the paper. Maybe I will mention to Francie the next time I see her that an addition of "news" to the website would be good! As for the water, I can only imagine. Something that big would certainly need it!